Before we will shed light on any features of Ves Pencil Magento 2 Responsive Template, let’s have a look at it core elements: product page, category page, cart, and checkout. Product pages of Ves Pencil Magento 2 Responsive Template are simple, intuitive, and attractive with all necessary buttons and navigation elements. 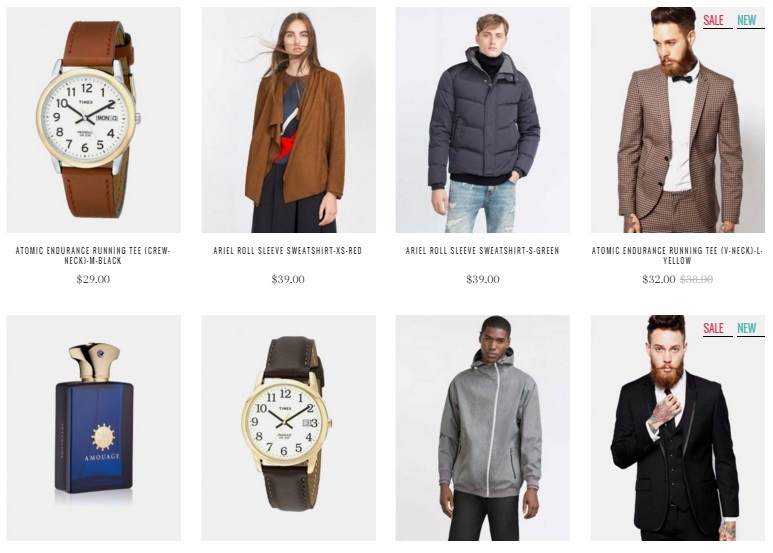 The same is about category pages: simple, attractive, and intuitive. Ves Pencil Magento 2 Responsive Template provides the ability to view your cart and clear it or update with new quantity for each item. Besides, you can continue shopping. And there is a clear view of your order total with estimate shipping and tax. Here, you can see a lot of fields and two steps, but the Ves Pencil checkout is not so complicated as the default ones. The number of customer information and required steps are minimized. 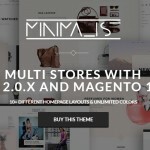 Now, we’d like to draw your attention to core aspects of this Magento 2 theme. Since Ves Pencil is fully responsive, your ecommerce website will deliver engaging user experience on all possible devices, providing your customers with the ability to shop anywhere and anytime. Another important feature of this Magento 2 template is rapid page load time. Ves Pencil is optimized for high performance, so it delivers home, category, and product pages as fast as possible. Additionally, we recommend you to implement other performance improvements described here: Magento 2 Performance Guide. And pay attention to the checkout of Ves Pencil once again. The Magento template offers an improved procedure that consists of less steps and minimizes customer information required to complete a purchase. 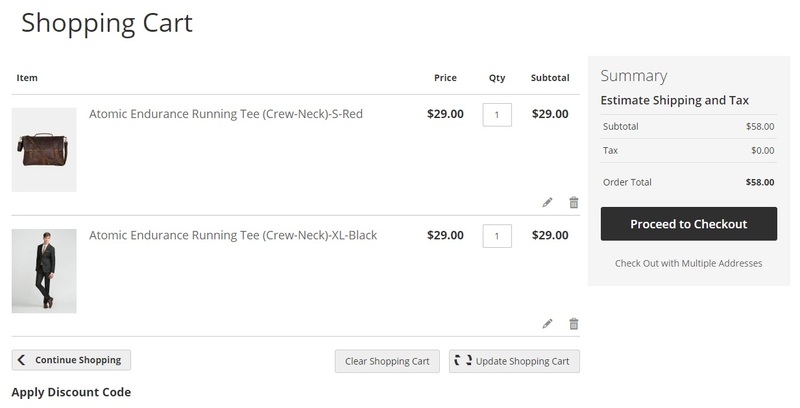 As a result, you can reduce your current cart abandonment rate, since a complicated checkout procedure is among its core reasons and you can avoid with Les Pencil. It is also necessary to tell a few words about the origin of the Ves Pencil Magento 2 template. 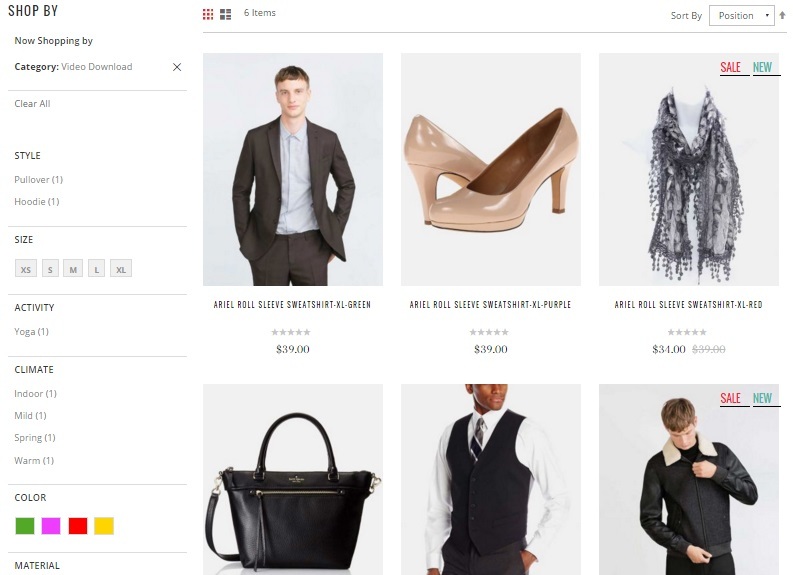 Being entirely inherited from Magento 2 blank theme, the template relies on the user interface introduced in the second version of the popular ecommerce platform. As a result, we get a stunning look and an amazing feel. 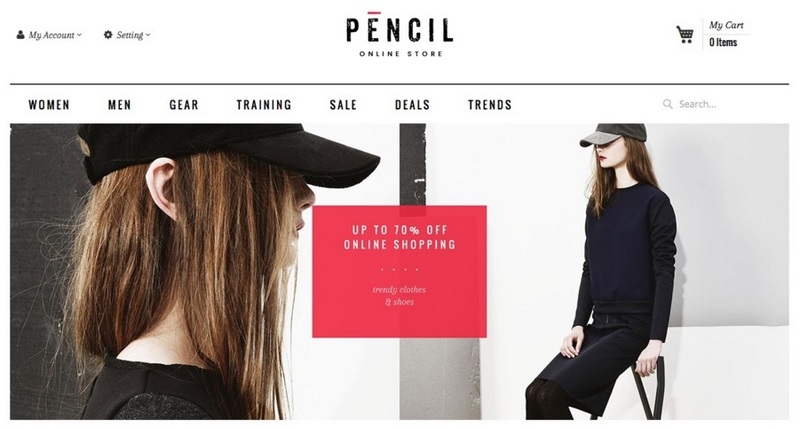 And from the perspective of Magento administrators, Ves Pencil is also a good solution, since it offers an intuitive backend developed with core ecommerce aspects in mind. The easy to use Admin Panel empowers its users to run their ecommerce business smarter and faster. Now let’s discuss top user-oriented features of the Ves Pencil Magento 2 theme. The first thing you will probably pay attention to is a gorgeous slideshow. This feature is implemented with the aid of Owl Slider that helps to display your goods in the most most attractive way. You can easily customize the way pictures are shown by using various effects. Another notable enhancement introduced in the Ves Pencil Magento 2 template is Quickview Product. 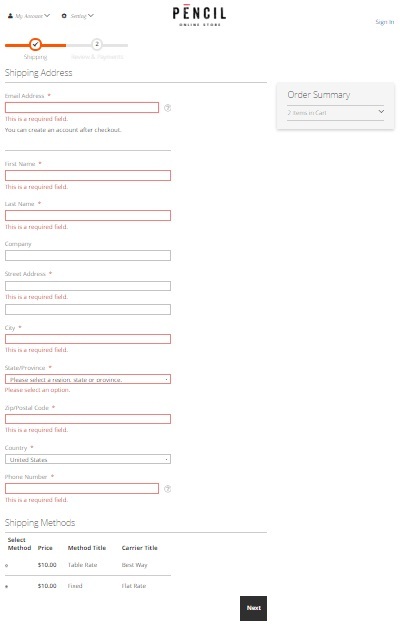 With this feature, you customers get an access to product details without any need to reload a current page. As you might have guessed, AJAX should be involved here! And if you are worried about your mobile customers, when there is an off canvas menu provided by Ves Pencil. 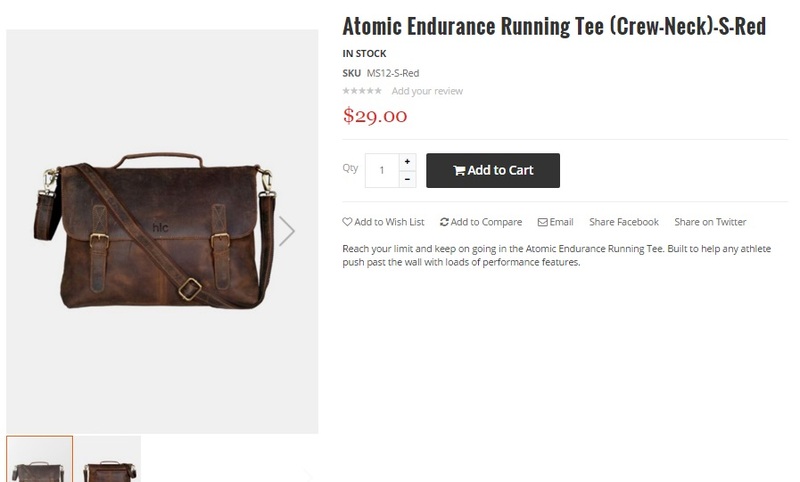 The off-canvas menu makes shopping on your Magento 2 website on mobile devices as convenient as it is on desktop ones. As for product images, the Ves Pencil Template provides the ability not only to create a beautiful gallery, but showcase pictures in the most attractive way on both desktop and mobile devices. And there is a product carousel that looks especially amazing on smartphones and tablets. The feature is entirely optimized for touch and drag-n-drop gestures. As a result, your customers can easily find what they are looking for. Besides, you can choose between multiple homepages developed with the aid of the Magento Pages Builder module. Another thing that is worth mentioning when it comes to Ves Pencil is a set of extensions you get with this Magento 2 template. The first one is Ves Pages Builder Magento 2 ($79), which is used to provide Drag n Drop multiple homepage layouts. Another extension incorporated in the template is Ves Product List – the aforementioned product carousel. As for theme settings management, it is possible due to the Ves Themesettings extension. There is also the Ves Megamenu module ($39) responsible for horizontal and vertical menu profiles. And you can get all of them for just $84. Besides, Ves Pencil Magento 2 Responsive Template offers quality ensured by Envato, guaranteed future updates, and a half year of support. To extend the support for a whole year, pay $25.20 more. And don’t miss the discount: there is the “Get it now and save up to $33” button on the appropriate ThemeForest page.